CRPs Re-engaging Cluster Resource Persons services Reengaged from 01.05.2017. Re-engaging of Cluster Resource Persons from 01st May 2017 -Office Of The Commissioner & Director Of School Education & Ex-Officio State Project Director, Sarva Shirsha Abhiyan, Telangana, Hyderabad. Memo.No.646/55a/Plg./T7/2014. Date: 01.05.2017. Permission the services of Cluster Resource Persons are required for this work, while modifying the proceedings in the reference cited. the District Educational Officers are permitted to re-engage the services of Cluster Resource Persons from 01.05.2017 strictly basing on the Appraisal Report given by the controlling officer. OFFICE OF THE COMMISSIONER & DIRECTOR OF SCHOOL EDUCATION & EX-OFFICIO STATE PROJECT DIRECTOR, SARVA SHIRSHA ABHIYAN, TELANGANA, HYDERABAD. 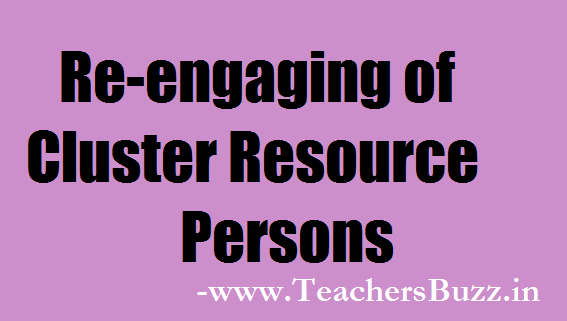 Subject : TSSA Hyderabad - Planning & MIS - Re-engaging of Cluster Resource Persons - Permission - Accorded - Reg. Ref: This office Procs.even no. Dt.22.04.2017. Vide reference V cited, all the District Educational Officers were Informed to disengage the services of Cluster Resource Persons from 20.04.2017 and to re-engage the CRPs from 01.06.2017. In this context, since the supply of Uniforms at the School point for the academic year 2017-18 has to completed before re-opening day of the School. The services of Cluster Resource Persons are required for this work, while modifying the proceedings in the reference cited. The District Educational Officers are permitted to re-engage the services of Cluster Resource Persons from 01.05.2017 strictly basing on the Appraisal Report given by the controlling officer. Any deviation In the matter will be viewed seriously and action will be taken as per rules. To All the District Educational Officers & EO-DPOs. SSA in the State. Copy to all the District Collectors & Chairman, SSA in the State. Copy to the State Finance Controller of this office. Permission the services of Cluster Resource Persons are required for this work, while modifying the proceedings in the reference cited. 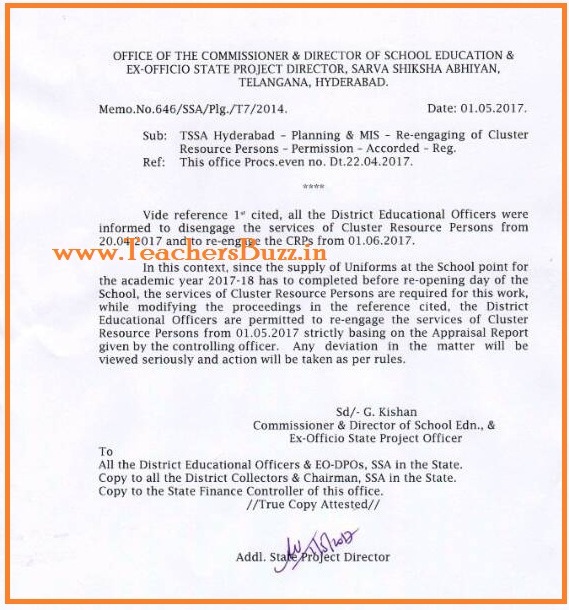 the District Educational Officers are permitted to re-engage the services of Cluster Resource Persons from 01.05.2017 strictly basing on the Appraisal Report given by the controlling officer.